Cuckoo is a BBC show starring Andy Samberg and Helen Baxendale, that has recently shown up on Netflix as a “Netflix Original”. They have tried for an American version, which never got picked up by any channel. I’m going to focus on Season 1, which I find to be the best season of the show, after which they changed up some characters and actors. 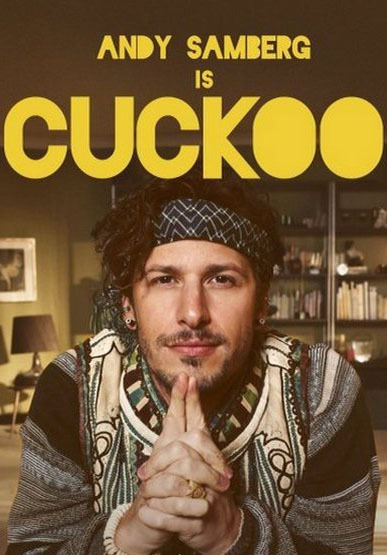 Andy Samberg is a hippie named Cuckoo who marries a British girl during her year abroad in Thailand, much to the dismay of her parents. From meditating naked on the kitchen counter to being stoned, there’s no end to how he’ll annoy his new father-in-law…so his father-in-law gives him some “go away money”, which he promptly spends on a potato van to sell “jacket potatoes”. If you aren’t convinced enough to go through Season 1 by Andy Samberg, just get to the third episode, “Ken on E”, and the series should leave you intrigued. Season 1 gets a 6.5 out of 10. I liked Season 1 but Season 2 completely lost me. Haha, that’s about where I am now… Lost in Season 2. Season 1 is the way to go! I really do think Andy Samberg makes the difference!